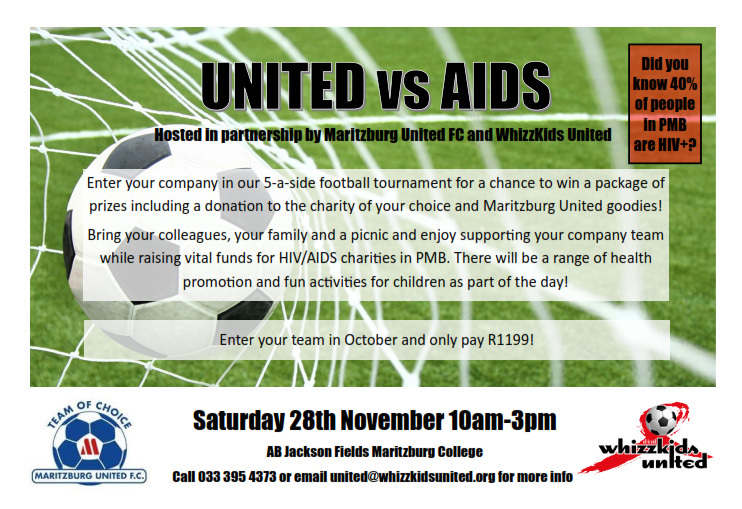 To mark World AIDS Day, WhizzKids United and Maritzburg United FC areproud to announce a “UNITED vs AIDS” football tournament to bring the community together and raise funds for HIV charities in PMB. The virus has caused more than 35 million deaths worldwide, which makes it one of the most destructive pandemics in history. Since 1988,World AIDS Day has been dedicated to increase public and governmental awareness. Its aim isto fight prejudices and discrimination, as well as to improve peoples’ knowledge. It is a great opportunity to show support and respect for people living with HIV and to remember those passed. This issue is of high importance for our community, asaccording to the Provincial AIDS Council 1.8 million people are infected with HIV in KZN and 3.4 million suffer from this disease within the whole country. Astonishingly 4 out of 10 people are HIV+ in PMB. Thus, companies are invited to sign up their teams, bring their colleagues and promote their business at the event. The price money will be donated to the charitychosen by the winning team. 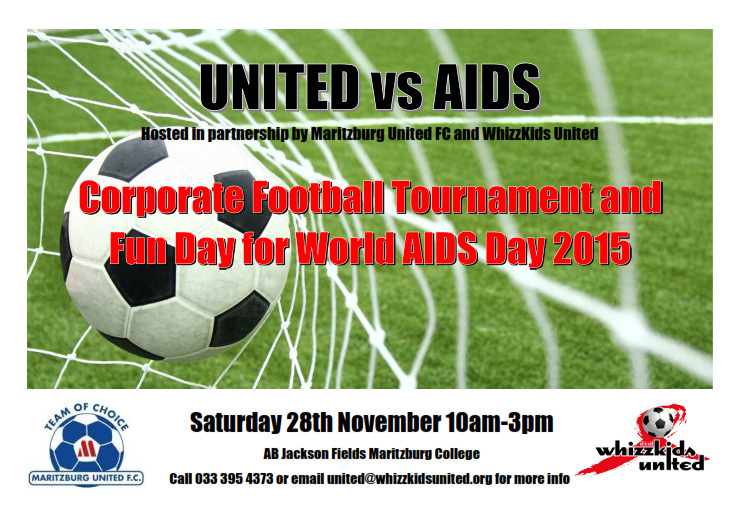 UNITED vs AIDS will take place on November 28th from 11am – 3pm at the AB Jackson Fields, Maritzburg College. Therefore, businesses are encouraged to register as soon as possible as spaces are limited.Secure your teamuntil October 31stfor an early bird fee of just R1199. Call 033 395 4373 or email united@whizzkidsunited.org for more information. WhizzKids United (WKU) is an award-winning health care and HIV prevention programme, operated by the Africaid Trust. WKU runs a school based life skills programme that uses the power of football to educate young people and to raise awareness around the challenges of HIV & AIDS. In partnership with KZN Department of Health, WKU operates the Health Academy in Edendale Pietermaritzburg, an adolescent friendly clinic facility, which provides a wide range of medical and psycho-social services, along with educational and recreational activities to over 6.000 youth each year. Maritzburg United FC was founded in 1981 and is a professional football club that plays in South Africa’s premier soccer league. The club stages, assists and participates in community organized tournaments to communicate directly with supporters, community leaders and NGOs to address social issues of the communities.